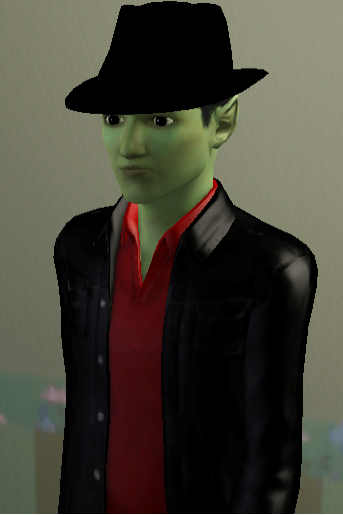 Way back when, when I began playing The Sims 2, one of the first families I created was the Lee Harkers. The founder, Gabriel, was a scientist, as was his wife, Katerina. Thanks to Gabriel's keen interest in astronomy, the couple's first child was a tad more... mysterious... than most. Michael, the Lee Harkers' alien son (or, to be specific, Gabriel's son and Katerina's stepson) was born a genius, partly due to his father's great mind, but primarily thanks to his extraordinary alien brain. Upon reaching adulthood, he used his gifts wisely as a detective, and soon, he became one of my favorite characters to play. Aside from solving cases brought to him by the townspeople, he was also keen to unravel the mystery of his own origins. I found this story so fun to create and explore, I revived it when I moved on to The Sims 3. Now, thanks to the Get to Work Expansion Pack introducing aliens to The Sims 4, Michael's tale can be rewritten once again - with the new features adding interesting new factors. This time, however, I'm going to share it with all of you... from the very beginning. And thus begins my first story series - Michael Lee Harker, Intergalactic Sim of Mystery. Enjoy!